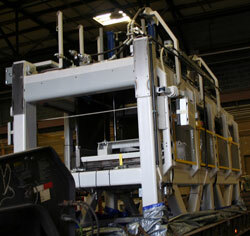 Strongwell built Pultrusion Machine (PM) 90 in 1998 as the world’s largest pultrusion machine. Today, Strongwell is pleased to announce that title will be shared with the newly-completed PM 91. PM 91 was completed and delivered to the Highlands facility on December 11th, 2013. Weighing in at 48,800 lbs. and coupled with 60,000 lbs. of pull strength, PM 91 is capable of manufacturing even the largest of pultruded fiberglass parts. 4,000 glass fiber rovings can be easily accommodated with a state-of-the-art catwalk roving rack system that will be built early next year for this new machine. A new user interface system and control system has also been introduced, allowing easier maintenance access and functionality among its operators. The impressive statistics of PM91 require PM90 to share the title of world’s largest pultrusion machine. With machines 90 and 91 in its fleet, Strongwell continues to boast unmatched capabilities and capacity for pultruding the world’s leading fiber reinforced polymers.